A high performance 1050mm (42”) belt feeder, with hydraulic variable speed drive, is fitted to the machine as standard and has proven performance and versatility in demanding and varied working environments. 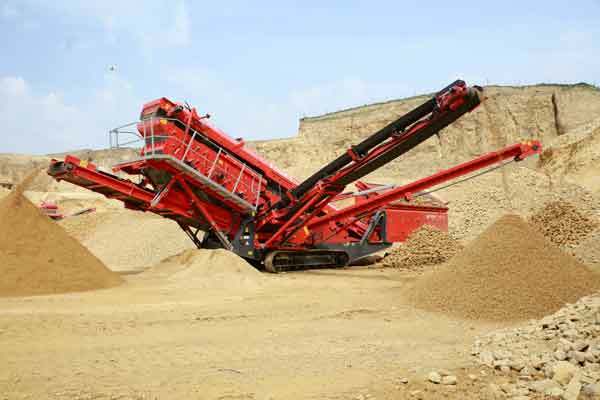 The hopper has an 8m³ (10.50yd³) capacity as standard and can be fitted with remote control hydraulic tipping grid. A Caterpillar C4.4 air cooled engine is used to power the machine. The heavy duty crawler tracks, and optional radio remote control unit, make on site mobility very easy. This fully self-contained plant can be hydraulically folded and ready for transport in less than 30 minutes making it the ideal machine for contract screening. •	The fourth (oversize plus) conveyor can work at varying angles and can accurately discharge for recirculation to crusher or for stockpiling. •	Maximum utilization of three decks provides ultra-efficient screening capabilities even at small aggregate sizes. •	Updated hopper and belt feeder gives improved material flow onto main conveyor.